In honor of All Hallow's Eve, I'd like to post a rather horrifying document, an email chain, that occurred exactly one year ago today between two frightful creatures. It's not the kind of document that will startle you or make you piss your pants....it's the kind that will turn your stomach and make you upchuck. Thanks to a public records request filed by an AZ reader and commenter, I've been going through a chain of former City Attorney Michael Sherman's emails regarding matters on Wisner. Sherman served as the appointee for Mayor Landrieu to the Advisory Committee. 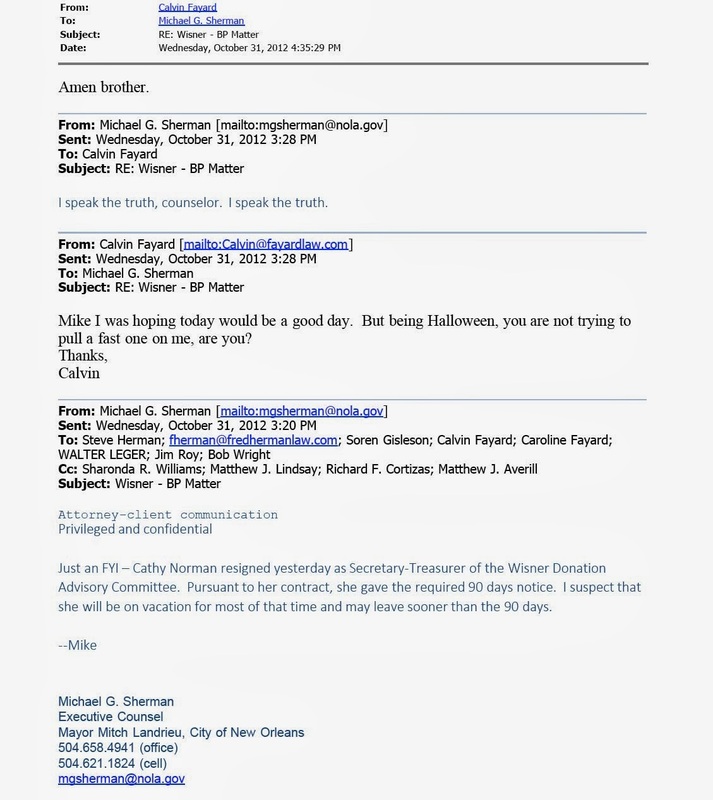 From the get-go, Sherman's primary target was former Wisner Trust Advisory Committee Treasurer/Secretary, Cathy Norman. His intimidation tactics have been well documented here on AZ, even in video. Numerous folks who attended the Advisory Committee meetings attested that Sherman "terrorized" Norman to the point where she simply couldn't take it any more and was forced to resign. I've even heard tell of an incident where Norman was called into the Mayor's office under the auspices of a one on one meeting with him (Mayor Landrieu) only to be hot-boxed by a room full of lawyers, some of them PSC/JV attorneys. A petty act of intimidation by petty men. How petty are these men? Well, I'm going to let you decide that after you read this email chain where Sherman gleefully announces to the JV inner circle that Norman finally resigned, broken by their tactics. Even more than Calvin Fayard's obvious schadenfreude over Norman's departure, the part that made me laugh and barf at the same time was Sherman proclaiming that he "speaks the truth". What a rare moment for him indeed...I imagine it did feel good for him to speak the truth. I believe there was a concerted effort on the part of the Mayor to oust the people from the Advisory Committee he didn't like and replace them with his own cronies. I've also suggested that LSU and Tulane colluded with the Mayor's wishes by removing their appointees in order to replace them with folks who would follow the Mayor's wishes, Ron Gardner and Anthony Lorino. Once these cronies were appointed, they immediately followed Sherman's lead to fire the Wisner Trust's counsel on the BP lawsuit, Waltzer and Wiygul, and replace them with the JV attorneys you see listed in the email thread above. I don't expect anything to come of this exposure but if nothing else I want the public to know the truth. I want them to know what kind of people are roaming the halls of City Hall and pulling the strings of City government. For the people that actually care to know, that want to know, I think it's important to air this nastiness out. At an admittedly critical time in the history of the Donation, faced with some of the most important decisions the Donation will ever have to make, Fayard offers a vulgar celebratory “amen brother” to the confirmation of the news that the dedicated, committed and concerned manager of 20 years has resigned, taking with her intimate and irreplaceable knowledge and experience. Can Fayard and Sherman honestly say they had the best interest of the Donation in mind by allowing such a valuable and passionate advocate and caretaker to resign? That's a great find. Mr. Sherman seems like quite the sycophant. Sycophant - or more preferably in Sherman's case....'bootlicker', 'lackey', or 'doormat'. Similar behavior by Mr. Sherman can be exhibited in his relationships with Mitch Landrieu and Laney Chouest to name just two. Anyone know why Sherman and Sapir had a falling out with one another? they were supposed law partners at one time. I don't want to take the focus off the reprehensible conduct of Fayard and Sherman and how they may have caused more problems for the Donation than can be measured. But, you should know Mr. Sherman's behavior extends to family members of those with whom he wants to curry favor. 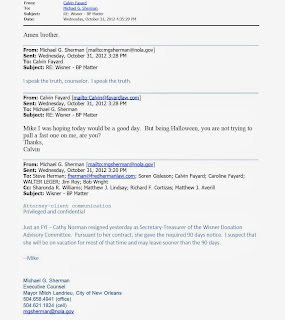 Example: Just days before he and his team terminated W&W and hired the Fayards and their JV group, "Mike" and his team were busy helping Caroline Fayard, in-house counsel for the Junior League of New Orleans, get the records straight on the tax exempt status of the JLNO. Those pesky tax bills! Did Michael Sherman make any attorney or consulting fees (referral or otherwise) between January 1, 2011 and today in connection with the BP spill? Did Michael G. Sherman, his family or his businesses submit any personal or business claims between January 1, 2011 and today in connection with the BP spill? Was Basile Uddo under contract to or employed by the City of New Orleans at the time he wrote the July 25, 2013 ethics opinion in connection with the JV attorneys? Did you and anyone else do anything to constructively discharge Cathy Norman? The Wisner Fund's private looting is ghoulishly all too similar to how greedy St. Bernard lawyers and politicians conspired to privately attempt to consume all the money in the Meaux Public Trust Fund which they fiscally swore to honestly disburse solely for the public's good. That's why they call him Sherm the Worm. Finally exposed, thanks to AZ. Amen, Brother.